is now Live in their system. WAHOO! We are bringing her the day bed that currently resides in my bead room. YAY MORE ROOM IN THE BEAD ROOM! I plan on adding another table and moving my light box to that and possibly I'll have a little packing area too. Awesome! We are also picking up the cedar chest that was my Grandmothers. Come to find out, Grandpa BUILT the cedar chest himself, for my Grandma. And He thought it only right, to give it to the oldest Grandchild!! :) aww! AND I guess the cedar chest also comes complete with my Grandma's wedding dress!! Another reason we are headed home is so that I can collect some of the handmade Aprons that my momma is making. I have agreed to open an Etsy shop (or possibly a 1,000 Markets shop!) and to manage this shop that will sell her aprons. I have spent a lot of time trying to talk her into this and I hope that I can do a nice job in trying to sell them for her. She really could use a little extra money these days and she's a whiz at the sewing thing. Me? Not so much. Congratulations on your new shop! Now I will have to get signed up for Amazon payments :-) I can't wait to see your mother's aprons. I rarely cook but love aprons. Wishing you much success (not that you need it). You'll be selling those aprons like hot-cakes too I'm sure. Congratulations on your new shop, you are a wealth of information. I'll be looking for your mom's aprons! Good luck on your new shop. Lorelei! I love, love, love your new banner. It's fantastic! Renee designed the one I have in my shop as well. She's great to work with. Best of luck in your new venture. Love your new shop! I also love aprons and wear them quite a bit when cooking, so I'm anxious to see your mom's work. Congratulations on your new shop! It looks wonderful. Thank you ladies! I appreciate your well wishes. I've already made one sale in my new shop!! YAY! I am so thankful of my bloggy support system! Congrats on your new shop and first sale! I love your new banner there!...good luck in your new endeavor. That's a great idea! I'll mention it to her tomorrow. She might go for that. Thank you for the nice words about my recent pieces. 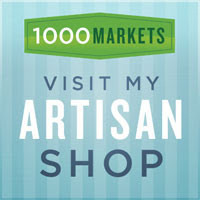 I just listed the collaboration pieces in the 1000 Markets shop. I would love to see them sell.